(Phys.org) —While scientists have become increasingly convinced that the Standard Model of particle physics is incomplete, it's still unclear exactly how the Standard Model needs to be extended. Experiments have shown that the Standard Model cannot explain certain top quark observations, but a variety of extensions of the Standard Model have been proposed to explain them, and it's unclear which extension is correct. In a new paper published in Physical Review Letters, physicists Benjamín Grinstein and Christopher W. Murphy at the University of California, San Diego, have explained how upcoming data on the bottom quark can be used to distinguish between competing new physics explanations of unexpected top quark data. "There has been much excitement the last couple of years precipitated by reports by the two experimental collaborations working at the Tevatron (at Fermilab, outside Chicago) that a much larger-than-expected top-quark forward-backward asymmetry is seen," Grinstein told Phys.org. "Several models have been proposed to explain this unexpected result. Our paper suggests a way to distinguish among the various models that have been proposed, since these models give very different bottom-quark forward-backward asymmetries. When a sufficiently precise measurement of the bottom-quark forward-backward asymmetry is performed, we will be able to narrow down significantly the new physics that the Tevatron experiments seem to have uncovered. "But perhaps more importantly, observations of the bottom-quark forward-backward asymmetry in disagreement with expectations from the Standard Model, when put together with the top-quark forward-backward asymmetry, would demonstrate fairly conclusively that there is new physics in the form of new particles and interactions not included in the Standard Model, and would point the way toward its direct experimental confirmation. So, as you can see, this would go to the heart of the question in particle physics." As the physicists explain, a quark's forward-backward asymmetry refers to the likelihood that the quark is moving in the forward or backward direction after it is produced in a proton-antiproton collision. "The Tevatron is a large circular particle accelerator in which protons and antiprotons travel in opposite directions," Murphy said. "The direction of travel of a proton at the point it collides with an antiproton is called the 'forward' direction. Often a b-quark and an anti-b-quark are produced as a result of the proton-antiproton collision. There are several ways to define a 'bottom-quark forward-backward asymmetry,' but they all are a measure of how more (or less) likely it is for the produced b-quark to be moving preferentially in the forward direction. For example, one may count the number of collisions with a forward-moving b-quark, subtract the number of collisions with a backwards-moving b-quark, and divide this by the total number of collisions that produce b-quarks. It should be noted that the asymmetry is not just a single number because it can be determined for various values of the energies of the produced b-quarks. So in fact the asymmetry is a function of the energy of the b-quarks." If new physics is involved, as the physicists expect, then the bottom-quark forward-backward asymmetry might be larger than predicted by the Standard Model, or the asymmetry may even be reversed. "The Standard Model of electroweak and strong interactions predicts a very small bottom-quark forward-backward asymmetry at the Tevatron, of the order of a few percent," Grinstein said. "What we have shown in our work is that new physics can change this number dramatically. One of the interesting features we discovered is that when the energy of the b-quark and b-antiquark sum to the rest energy of the Z-boson (one of the particles responsible for weak interactions), the asymmetry is enhanced. We furthermore showed that, at this particular energy, the effects of new physics can be greatly amplified. For example, in one popular class of models the sign of the asymmetry is reversed, relative to that predicted by the Standard Model, in the energy region corresponding to the Z-boson's rest energy." The plots in the physicists' paper tell a more detailed story of the possibilities for new physics. 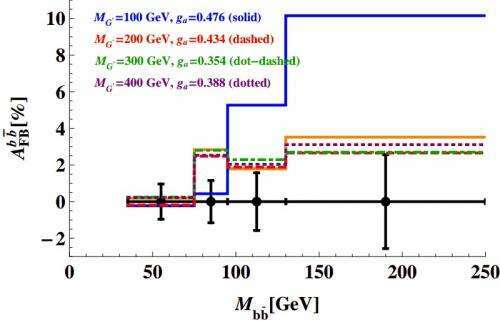 The two plots included here show the predicted bottom-quark forward-backward asymmetry (in percentage) plotted against the energy (in GeV units) of the bottom quark-antiquark pair produced in the proton-antiproton collision at the Tevatron. In both plots, the orange line represents the Standard Model prediction, while the other colors correspond to predictions from proposed extensions of the Standard Model. The plots are not continuous, but instead they are bar graphs in which the quark pairs of energies in given "bins" are collected together. The black vertical bars indicate what the CDF experiment at Fermilab predicts as its sensitivity, meaning they will be able to distinguish between colored lines that are separated by more than the size of the black bar. @ Zephyr, there ya are, I was beginning to worry that Doc Brown fellow had sent the tipstaffs after ya. "While scientists have become increasingly convinced that the Standard Model of particle physics is incomplete, it's still unclear exactly how the Standard Model needs to be extended. 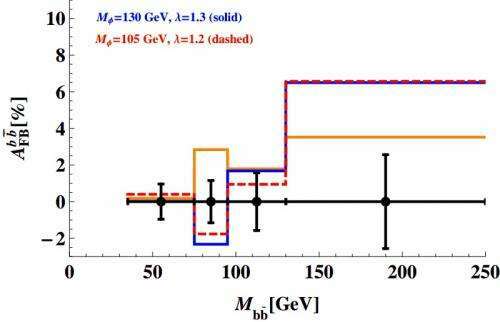 Experiments have shown that the Standard Model cannot explain certain top quark observations,". Zyga is blatantly lying yet again, on a science web site about science. The Standard Model was just completed, but it is known to be a not complete account for particles. (E.g. doesn't predict neutrino masses, Higgs masses, DM or the inflaton.) That is different. And those "top quark observations" are known to be ~ 2 sigma from combined data fishing, or as the paper itself confesses not even 3 sigma if cherry picked. 2 sigma effects come and go. and there is as of yet nothing new for the SM to predict. Yikes, and more lies, now from an anti-science troll. There is no such predictive, established theory. The standard model is all wrong, because mass is an intrinsic property. I always thought that quark asymmetries were necessary for differentiation to occur. If all the color change combinations in quantum chromodynamics were realized, then reality would not necessarily be skewed the way it is, and existence of the universe would have been over in a relatively short time. Sort of like comparing a complex fractal to a simple triangle. Creation is, after all, a fractal expression.